A bridge rectifier in a Dynaco amp or transformer center tapped secondary will perform identically as the two diode full wave rectifier with the following exceptions - bridge has two diodes on each leg in series (higher pk inverse voltage) and extra diode drop which is significant at low voltages. So no real advantage in using bridge vs. full wave in a Dynaco design. Bridge rectifiers are used in power supplies without a center tap secondary. Full wave wouldn't work without the center tap connected to ground. So which type to use depends on the power transformer secondary and the needed rectified voltage. And yes it is possible to use solid state diodes only. But you have to be careful and make sure the B+ voltage doesn't creep up excessively and become a concern for the filter capacitor's working voltage margin. Modern Dynaco type amps usually have a lot of extra capacitance so inrush current will be large and you may pop a fuse occasionally. And a standby switch or a relay board is mandatory with solid state. Weber makes a copper cap with diodes only (no series power resistor or thermistor) if you feel brave. But though you will have a lower impedance power supply using diodes only. The Weber copper cap WZ68 is a good compromise between actual tube vs straight diode rectification. The WZ68 mimics two GZ34s in parallel netting 1/2 the series resistance and double the current. Works well in circuit meant for a vacuum tube rectifier. I wouldn't be using the typical can caps. My plan is to build a ST120 but using Clarity TC caps in the power supply. They're 700V rated and I would just put a 45uF cap at the start. I was planning to use the copper cap you mentioned but have been reading about Schottky diodes and thought those along with the delay circuit board might be a viable option. My ST-70 project came with this mod. I have been informed that was done to replace the tube. I will be removing these diodes and installing a tube. Then doing the diode mod as per the instructions here. I was planning to use the copper cap you mentioned but have been reading about Schottky diodes and thought those along with the delay circuit board might be a viable option. Yes, that is a full wave rectifier diode bypass mod with two diodes in series for probably higher peak inverse voltage. How does it sound and what is the B+ voltage? 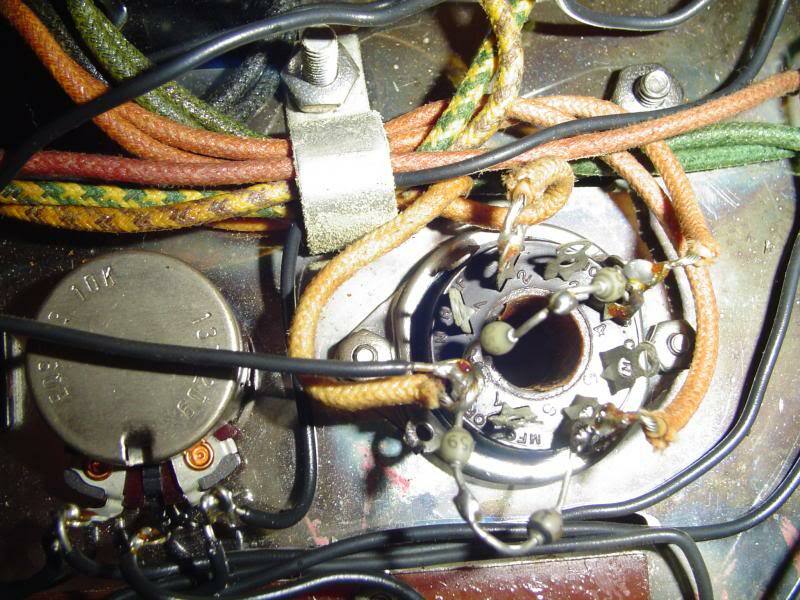 In a guitar amp I had to find the correct diodes to avoid diode switching hash noise. The latest ultrafast recovery diodes meant for switching power supplies cause a lot of ringing when they turned off. And you could hear it. Finally found some old school Philips BYM26E diodes (fast soft recovery) and problem solved. The diodes in the picture look similar to the Philips diodes used on my project. So if i read this right I could just use the red wires with a pair of diodes similar to the ST35 and just not connect the pair of yellow wires that normally go to the rectifier socket. That's easy. I found some rectifier diodes at The Shack that are 1000 PIV and 1.5A (Part Number 276-1114). I think the 1N4007s are 1A. Will these work for the rectifier diode mod on a ST120? "I found some rectifier diodes at The Shack that are 1000 PIV and 1.5A (Part Number 276-1114). " These are GP15M diodes with a slightly better current rating than a 1N4007. Note though the size is about 1/3 larger than a 1N4007. But should function OK in the circuit. OK - I am working with the ST120 and I'd like to install the 1N4007 rectifier diode mod in hopes of prolonging the life of my rectifier tube. I have two red leads from the power transformer going to pins 4 and 6. Two white leads from the power transformer going to pins 8 and 2. Pin 8 is shared with a red lead coming from??? I assume the two twisted pairs of wires, one red and one white, are from the power transformer. I've got the "yellow sheet" directions but those pin numbers don't match what I'm working with. Can someone please advise on where to put the two 1N4007 diodes? Pin 8 shares double duty as one side of the filament heater (white) plus it is also the high voltage DC output that connects by a red wire to the quad capacitor can. The reason for this is the rectifier cathode is directly heated. Instead of the two red AC wires connecting to the socket on pins 4 and 6 they are instead connected to pins 5 and 7. The diodes connect between pins 4-5 and 6-7 to complete the circuit. Be mindful to ensure the diodes are oriented with the cathode band on pins 4 and 6 repectively. The yellow sheet is clear on where to place the diodes but you are correct it does not illustrate the HV DC red wire on pin 8 that connects to the quad cap. OK - I see I was looking at the completed mod, confused, and that the wires were as they are on my rectifier tube socket. Thanks for the clarification and roger that on the diode orientation. should i do this to my vta st 120 ? I recommend you do it. It's easy and it may save you from having to replace your rectifier tube but I'm sure you could live without it. I did this to my ST120 and I have a cheapo Sovtek GZ34 that is 9mo old. I listen loud fairly often too. The fast recovery diodes in a guitar amp I built caused hash noise. The fast switching induced ringing in the rectified voltage. Found some "fast soft recovery" diodes that cured the problem. The amp was straight solid state rectified and no tube involved. Fast recovery diodes are an overkill for slow commutation 50/60 Hz AC rectification. But if you hear no noise then no problem with either diode. The 4007 peak inverse voltage of 1kV rating may not be quite enough in an ST-120. If the tube rectifier blows (shorts) you can have +500V dc on the output and on the input side of the protection diodes over -500V peaks as the AC swings negative. If I were purchasing diodes for the ST-120 I would consider the higher rated 4008s at 1.2kV peak inverse voltage. In normal operation the 4007s are fine with effectively two diodes in series. Just the spec could be exceeded on specific tube failures. good morning fellas i have a question,im looking at a st70 its out of state so i cant test it .the seller said he hooked it up.the voulume on one channel was real low.the other channel was fine..as i stated i cant put my hands on it to trace the problem...worst case output transformer? resistor ? and or recterfier tube? output tube? any ideas of what i might have to fork out to fix..
it probably is all original and has a weak tube or worn out components on the driver board. Replace with our VTA70 driver board and new tubes (and most likely a new quad cap) and most likely you'll be all set! telefunking wrote: good morning fellas i have a question,im looking at a st70 its out of state so i cant test it .the seller said he hooked it up.the voulume on one channel was real low.the other channel was fine..as i stated i cant put my hands on it to trace the problem...worst case output transformer? resistor ? and or recterfier tube? output tube? Yes. Any of the above. A Stereo 70 can be anything up to 56 years old. It could have been pampered through its lifetime, or played hard and put away wet. There is no way anyone on this board can diagnose that amplifier with the information provided, especially since the information is secondhand from someone who wants to sell it. Best assume that he wants to get rid of some problems he's got with it. any ideas of what i might have to fork out to fix.. When buying a used amplifier like this, it is best to assume that you will have to put something into it. Even if the amplifier's circuitry has not developed any problems, tubes have a finite life and you'd best count on replacing the output tubes (the 7199 driver tubes last much longer...but getting good replacements can be more difficult). Since the amplifier does turn on and produce some sound ("fine" to some may mean "rife with distortion" to someone else), at least you know the power transformer and rectifier tube are good. I know this isn't the slam-dunk, "This is what your problem is and it will cost $2.98 to fix it" you wanted, but it's the reality of buying an old, used tube amplifier. The purchase of a vintage Stereo 70 is not a "turnkey" deal, like going to the store and buying new equipment. You will have to put a little of yourself into it, along with a little (or a lot) of your money. The very first post (by Roy) in this 2011 sticky thread showed a diode modification sketch to extend the life of the rectifier tube (I tried to copy it here but totally failed). My question is.....is this still a valid mod? The newest VTA ST70 kit drawings do not show these two diodes being used on the rectifier tube socket. The diodes are an extension of the two red power transformer wires, so I doubt these diodes would have ended up anywhere else. Hi Ed -- Yes, the Diode Mod is still valid!! It is valid for the original ST-70 and the VTA70. It can safely be stated to be valid for all amplifier units that use the GZ34/5AR4 Rectifier Tube. There was also some discussion on the board of using the Diode Mod with the Weber Copper Top Rectifier WZ68 which replaces the GZ34. Some have mentioned using the Mod with GZ37 or GZ33 Rectifier Tubes. Thank you for your reply Stewart! A lack of those installed diodes may be why I've read of people advising others to have some spare 5AR4 tubes. Guess I'd better round up a couple IN4007 diodes. Double checked the sent kit parts and no diodes or notes were added. Wonder why not.....they're cheaper than buying those tubes . Ten of them with free shipping for $1.79.....don't see how they can do it and make money. That is much less expensive than Radio Shack and the diodes are only available in a 25 piece assortment.....may only get one 1N4007 according to some reviews. I'm not understanding how those diodes can aid tube life. Aren't they just passing current to the tube that would be there anyway? I can't see how a diode actually does ANYTHING in that application but I readily admit I am not a circuit designer. I am NOT disagreeing; I just don't understand what, exactly happens where the diodes are useful. Feel free to send me to some existing explanation rather than posting something that is already clearly explained elsewhere. Addition of the diodes prevents current flowing in the reverse direction. How can this ever be? In the event of a power failure the power supply caps are fully charged. The rectifier tube is now reversed biased with a cooling cathode and potential for an arcing is highest which usually destroys the rectifier. When using 2 diodes in series like this (referring to post 15), it is best to use resistors (something like 330k) across each one to be sure they "share the load" equally. That begins to be a challenge fitting it into the space available, I admit. Another alternative is to just replace the Tube rectifier with a ss full wave bridge (I used a total of 4 iN4007's and 4 330k R) PLUS something like 50 ohm 10 W R between the output of the bridge and the first cap (This mimics the resistance of the tube rectifier and prevents voltage from going WAY high).